The importance of science, technology, engineering, and math (STEM) is a popular subject. But who is actually doing something about it? Here are some examples of STEM innovations in action, compiled by Tech & Learning. Description of STEM Program: The STEM Academy at Kenwood High School was introduced in the 2010– 2011 school year. The academy features an integrated core curriculum of math, science, social studies, and English, along with an engineering class, that will prepare students for educational and workforce opportunities in STEM careers. “Student competitiveness in the global economy is the foremost reason for moving toward a STEM way of teaching,” says chief academic officer Dr. B.J. Worthington. A student from Clarksville Schools holds a motion probe.Program Goal: The integration of the core areas will allow students to answer questions using the engineering design process: Ask, imagine, plan, create, and improve. How Executed: The STEM Academy uses laptop computers and graphing calculators. The Vernier probes, models, and lab equipment provide students the opportunity to collect and analyze data in math and science classes. Program Results: “Data collected during the pilot phase shows positive patterns of better attendance, lowered student discipline referrals, increased engagement, and higher achievement on assessment tests,” Dr. Worthington says. Colegio Colonial de Pirque is a small school located in the rural horsebreeding and farming community of Pirque, Chile. Students from six to 18 years old are eligible to participate in a variety of STEM-related programs that are available throughout the school year. Geo Leaders from Chile are ambassadors for Colegio Colonial’s environment-related projects.Program Goal: The school is working to become the first fully sustainable and green school in Chile by training Youth Eco-Leaders. How Executed: The school’s students and teachers planted an orchard, built a greenhouse, and created a garden with the support of environmentalists from their community. They use the vegetables from the garden to prepare lunch. Students on the school’s robotics team designed and installed an automatic watering system. Colegio Colonial de Pirque’s students are now researching how to heat and cool the school with solar power. Program Results: The program has been well received by the school, the Chilean government, and the community at large. Kids in all grades participated in building the garden, and many of them take part in the ongoing maintenance. 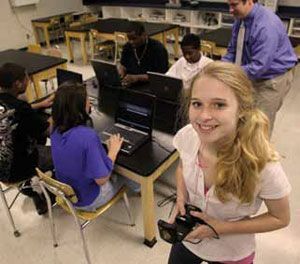 Description of STEM Programs: The Girls Get IT program works with schools from elementary through high school across Florida to increase the rates of participation and graduation among female students in STEM and IT courses. The program is operated by the Florida Endowment Foundation for Florida’s Graduates (The Foundation). VOiCE is a multimedia afterschool club that gives young people real-world, work-based learning opportunities in journalism, creative writing, songwriting, composing, graphic design, communications, and publishing. VOiCE is also operated by The Foundation. Program Goals: First, Girls Get IT and VOiCE engage female, minority, high-poverty and/ or rural students in hands-on STEM experiences. Second, the programs seek to sustain students’ interest and achievement in STEM core academic courses, ultimately increasing their comfort level and confidence in pursuing STEM majors and careers. “Young people need to be able to tear things apart and put them back together, and the best place for that kind of exploration is, many times, outside of the classroom,” says Heather Beaven, CEO of The Foundation. How Executed: Girls Get IT and VOiCE use after-school and summeracademy components to increase students’ achievement in STEM-related courses and careers. Program Results: Girls Get IT has delivered a 21 percent increase in the number of girls who say they “will” study science in college; a 45 percent increase in the number who “will” graduate with a degree in science, and a 39 percent increase in the number who “will” make a significant scientific contribution in their careers. “Girls Get IT taught me to work hard and keep at it,” says 16-yearold Summer Woshko, owner of Snail’s Surf Board Repair. Grants Received: Girls Get IT and VOiCE have dozens of local and national grant partners. Description of STEM Program: Applying technology to the sciences of anatomy and physiology. This program is aimed at seniors who are interested in college-level education in medicine, dentistry, occupational therapy, physical therapy, nursing, or athletic training. The STEM program at Oyster River High School applies technology to the sciences of anatomy and physiology.Tools Used: The money from three grants was used to outfit the classroom with an interactive whiteboard. Anatomy and physiology probeware from Vernier Software & Technology was purchased for studying the muscular system, cardiovascular system, and respiratory system. Program Goal: Have students experience hands-on science that is directly related to a field of study that they will pursue in college. “Students are expected to think outside the box and use the criticalthinking and problem-solving skills that have been developed throughout their education,” says Celeste Best, science teacher at the high school. How Executed: Students begin the year with a lot of structure and guided questions to help them plan and execute their ideas, but as the year progresses, more freedom and less guidance are given. “In the early stages, the focus is often on the technology and how to use it properly, but as we progress, the emphasis becomes on the science, and the use of the technology is simply a tool to achieve a goal,” Best says. Description of STEM Program: Roadrunner Elementary uses the free STEM education curriculum offered by NASA via the Green Schoolhouse Series program. The Green Schoolhouse Series is building and donating to Roadrunner a state-ofthe- art, LEED Platinum schoolhouse with a STEM classroom. Program Goal: Improve educational opportunities for students by using free STEM programs. How Executed: Flat-screen televisions were installed to facilitate satellite learning with the NASA channel. In addition, exchange programs were established in which students from all over the world can link up by using donated Cisco systems. Program Results: To be determined. Grants Received? No grants, but the program is sponsored by DeVry University. “These classes are designed to teach kids how to do cool things with technology right now,” says Ryan Bednar, cofounder and CTO of Tutorspree. Students learn computer programming at Tutorspree.Program Goals: In all of New York City, only 1,102 kids took AP Computer Science in 2010—that’s out of 180,000 total tests taken. How Executed: The program is a series of classes programmed as after-school activities in New York City. The classes are run by highly effective educators. The program is “totally repeatable” by schools, Harris says, but they need access to the right teachers and to materials supplied by Tutorspree. Program Results: Not available yet.